Windows 7 is capable of burning a DVD without any additional software – so unlike with Windows XP, there’s no need for applications like Nero Burning ROM. These notes give an example of backing up everything in My Documents, My Pictures and My Music to a DVD. If you have more than 4.5 GB of data shared between those folders, you’ll need to complete the backup over more than one disc. Make sure that all of your other programs and documents are closed before continuing. 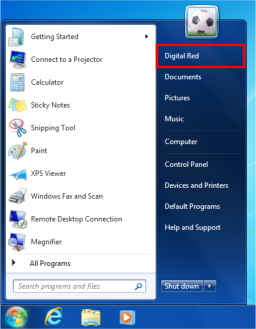 As we will be copying My Documents, which includes the Outlook data file (assuming you’re using Outlook 2010 or later), you must close Outlook before beginning: it’s not possible to copy the Outlook data file while Outlook is open. To begin, click the Start button at the bottom left corner of your screen. You’ll see your user folder – where My Documents and My Pictures etc are stored. We want to select the folders that contain your data, and as there is more than one folder, we need to hold down the CTRL key on your keyboard. 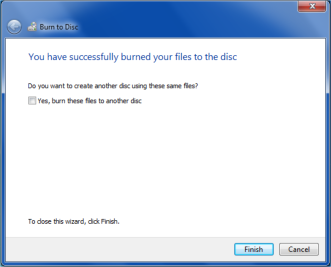 Optionally you can give the disc a name – but don’t worry about that unless you really want to – you’ll not really see it again. Do make sure, though, that you select With a CD/DVD player option: don’t accept the default of Like a USB flash drive. You’ll see a Copying… window open while a temporary copy of your files is made. 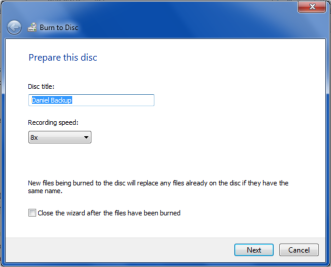 This copy is made so that Windows can be sure that the files you’re burning to your DVD are not changed during the burning process. The temporary copy of the files will be deleted automatically at the end of the process. 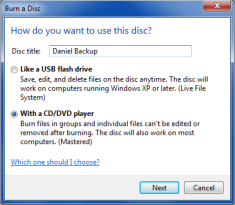 Once the backup is complete, you’ll see this window, and at the same time, your DVD will be ejected. Click Finish to complete. The temporary files are automatically deleted. Once your DVD is finished, be sure to label it. If you write on the disc’s surface itself, be sure to use a soft tipped permanent marker pen: not a ballpoint, rollerball, or dry-wipe marker! Always keep DVDs flat (either laying down, or standing – just not at an angle so that they don’t bend) and always keep them out of direct sunlight.